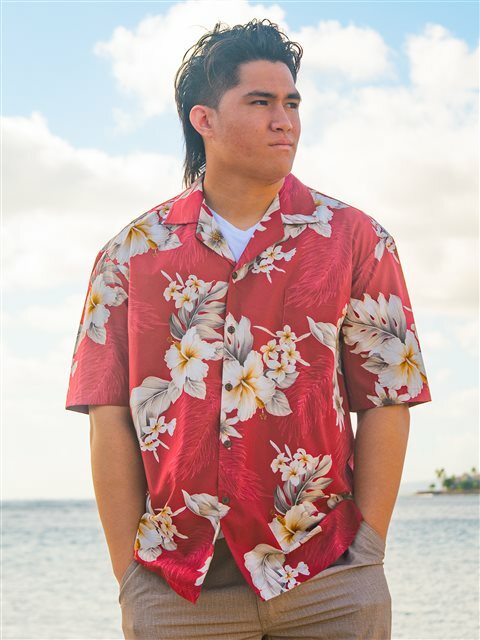 This classic Aloha shirt is made of 100% cotton. With a beautiful mix of Hibiscus and Plumeria flowers wresting on a bed of Ti and Hawaiian Fern leafs on red fabric, this piece has a very summery vibe to it. Also to note is the appearance of the Hawaiian fern in background of the piece which shows the attention to detail when creating this shirt. Great for casual or formal occasions. Pacific Legend Apparel sell fusion mix of traditional Hawaiian sytles, colors and patterns with a unique utilitarian trait. Their quality garments are comfortable, stylish and durable. Measurements of the size chart are for the shirt. Please add 2 - 4 inches to your body measurements when selecting your size. My first-ever Hawaiian shirt had a very similar design and this replacement is even better! Looks great and I love the high quality material and that's it's made in Hawaii. I was pleased with the feel of the material and quality of the shirt. The flowers 'pop' off the red shirt. Love the pattern and the quality of the shirt is great. Excellent material quality and very comfortable to wear. I ordered this for my fiance for our upcoming wedding! The shirts are so pretty! I ordered them for the groomsmen for my upcoming wedding.